After an anxious morning in Sydney airport because customs wouldn't let Ebbs out of the country on his Irish passport because he had used his Australian passport to enter the country last time... (honestly) we finally boarded our plane and were on our way to The Philippines. The flight took just over 8 hours which is a pretty long time on a budget plane with no entertainment or food so we were pretty uncomfortable by the time we arrived. The flight cost us $211 direct to Manila with Cebu Airlines. 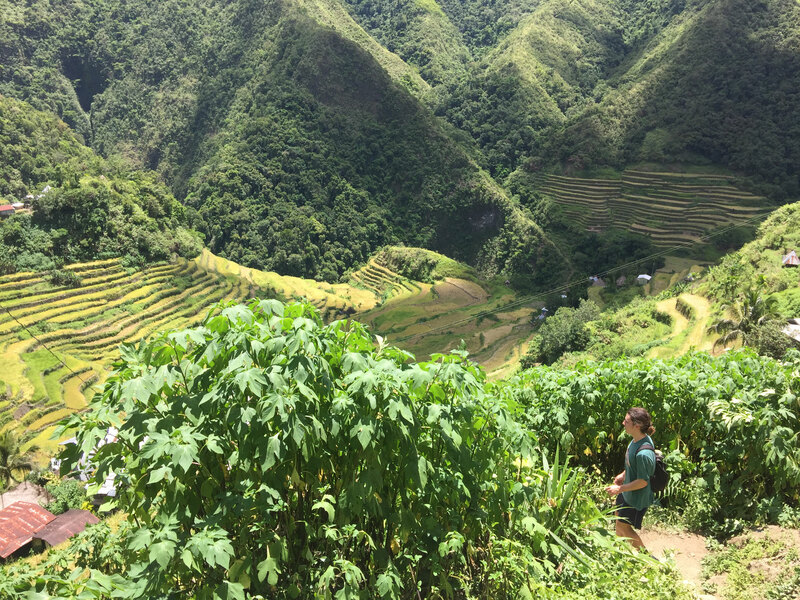 Batad was our first destination on our month long trip through Asia and in order to get there we had a ridiculously tight schedule to stick to. Everything was contingent on us making our 10pm overnight bus from a station in Manila after our flight landed at 7pm. If we missed this bus we would be stranded in Manila with no accommodation and nothing to do until our flight to Palawan 2 days later as we wouldn't have enough time to reach the rice paddies. I knew it was a bit of a risk but I was desperate to fit as much into the trip as possible so we took the chance. We came ridiculously close to missing the bus. So close that Ebbs jumped out of our taxi whilst it was still moving and chased the bus ahead of us down the road (it wasn't going that fast). Don't wait in the downstairs taxi line outside Manila airport. We waited for over an hour and barely moved forward a meter in the line and there were at least 50 people waiting. The upstairs cue was moving ridiculously fast but once we had left the building we couldn't get back in to get up there. The traffic in Manila is APPALLING. I don't think i've ever been in a car that moved so slowly. The ride from the airport to the bus station was meant to take 13 minutes and ended up taking us an hour and 25 minutes. Withdrawing money from the ATMS in the Philippines has a surcharge of $6 and we didn't know that when we arrived and thought that it was just the airport ATMs. By the end of our trip we had probably spent $50 on surcharges because we kept thinking the next ATM wouldn't have a surcharge. THEY ALL HAVE SURCHARGES and they are all $6 so try and get as much money out at one time as you can. Manila airport is not scary AT ALL. Before we left I read a few forums to get an idea of how getting taxi to the bus station would be and every second person on there was raving about how threatening and awful manila airport was. Some people spoke about stabbings and shootings??? It was a normal airport, pretty advanced for an Asian country and I felt completely safe. So yep... no idea what these people were talking about. Manila itself didn't really appeal to me as a city. I'm not much of a city person to begin with unless its Paris... so the dirty streets and congested roadways wasn't really my thing. We met a lot of people who loved it there though so if you have time maybe stop for a day or two. The most complicated thing about Batad is getting there and it took a fair few hit and miss attempts before we made it. I found very little information online (which is usually what I depend on) so we had to trust what the locals were telling us in relation to price and timing (not usually the best thing to do as you're far more likely to be scammed if you don't know a services worth or your options). Anyway here is how we got there. If you are getting a bus from Manila like us make sure you give yourself at least an hour and a half to get there from the airport... The traffic was almost at a standstill the entire way. We sat nervously in the back of the taxi as we watched the minutes tick closer to our bus's departure (which was our accommodation for the night). It was a tense time which was compounded further by our driver not sounding particularly certain about where he was actually dropping us... We arrived just as our bus was pulling out of the station and Ebbs jumped out of the taxi and chased it down. Ebbs and I laughed in relief for a good 10 minutes after we sat down. I don't think i've ever felt so lucky in my life. There is a public jeepney that leaves around 3pm and will cost you about 150 pesos which is by far the cheapest option to get to Batad. 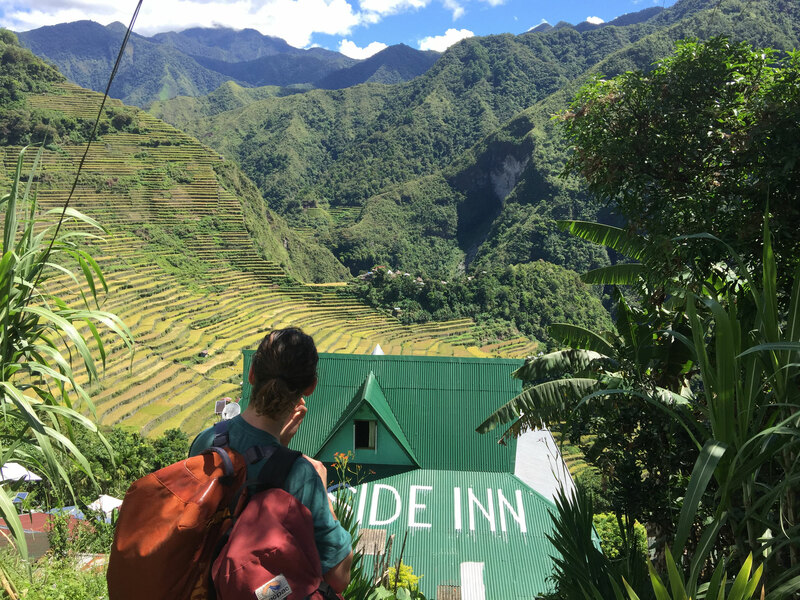 However if you are only staying in Batad for 1 night (like us) I would recommend spending the extra money to get a trike there at around 10am, there is honestly not very much to do in Banaue and the views are nothing in comparison to Batad. 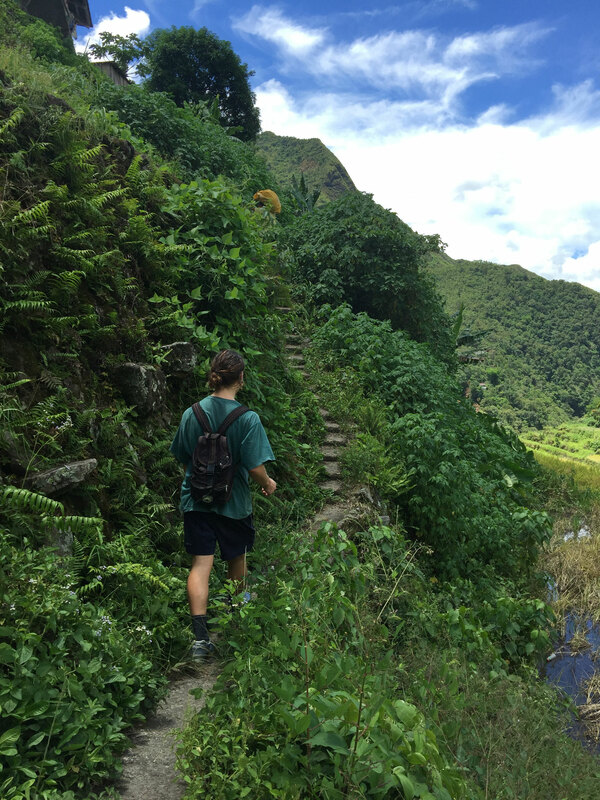 There is a 20 minute hike from the road to the entrance to Batad making it even more isolated (and fabulous) than it already was. The walk is easy even with bags so don't bother hiring a guide or a sherpa as some people do. Getting back to Manila was fairly simple. We organised for a trike to pick us up from the base of the saddle (although there were lots of trikes and jeeps waiting there so if you didn't book you should be fine getting back (plus it will cost you less). We gave ourselves 4 hours to get back to Banaue and to the bus stop for our 7pm bus (thank god because our trike broke down and we ended up with 40 minutes to spare after waiting for a rescue bike for an hour and a half). 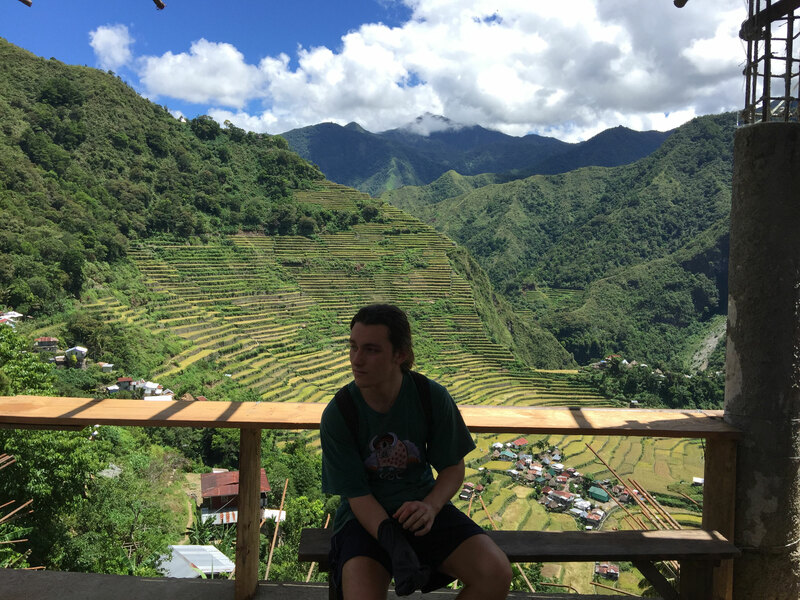 The bus leaves from the bus station in Banaue at around 7pm and will arrive back in Manila at 4am. There were plenty of taxis around and we got one to drive us to the domestic airport for $6 (250 pesos) for our flight to Palawan at 9. 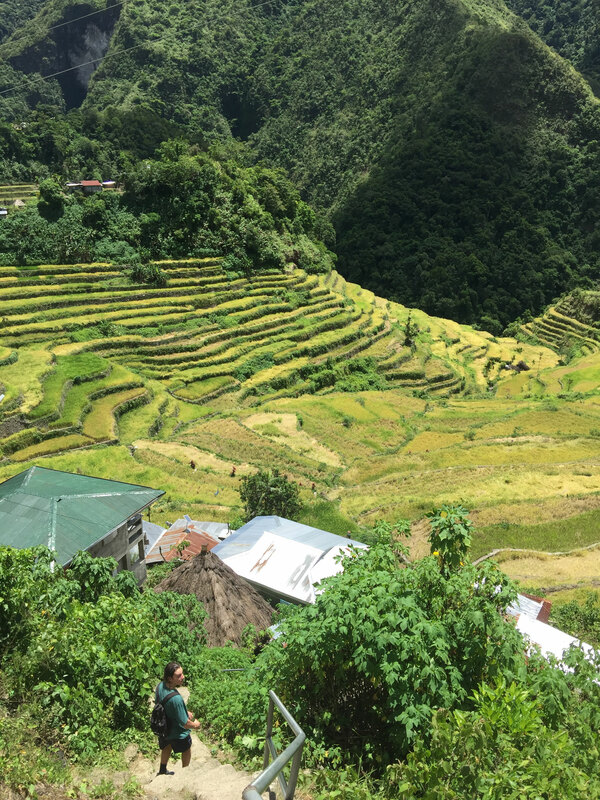 Our overnight bus arrived in Banaue at around 8 30 in the morning. Once we got off we were made to pay a national park fee of 20 pesos each. 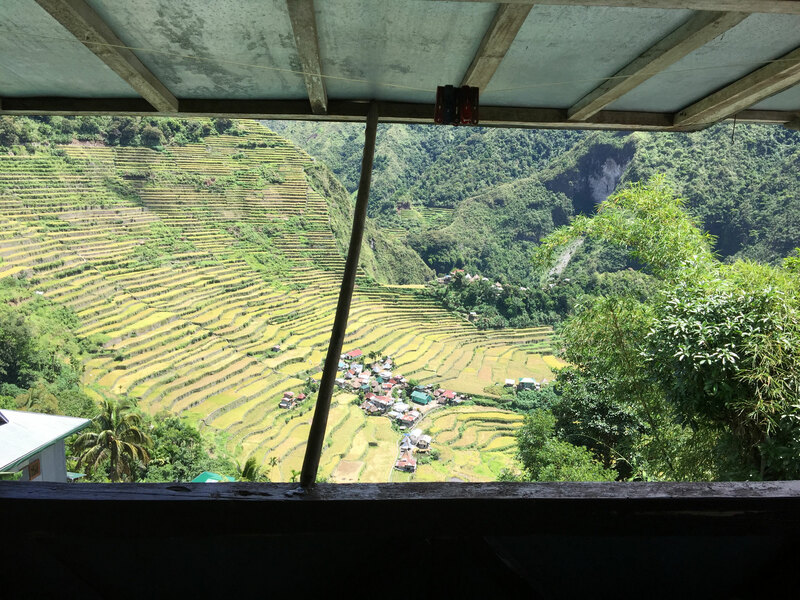 We were then ushered into a jeepney that took us down to the center of Banaue where we had breakfast on a balcony overlooking the rice terraces. Our breakfast cost us 120 pesos each and was ridiculously average. By the end of your time here you will be craving fresh fruit and vegetables!!! 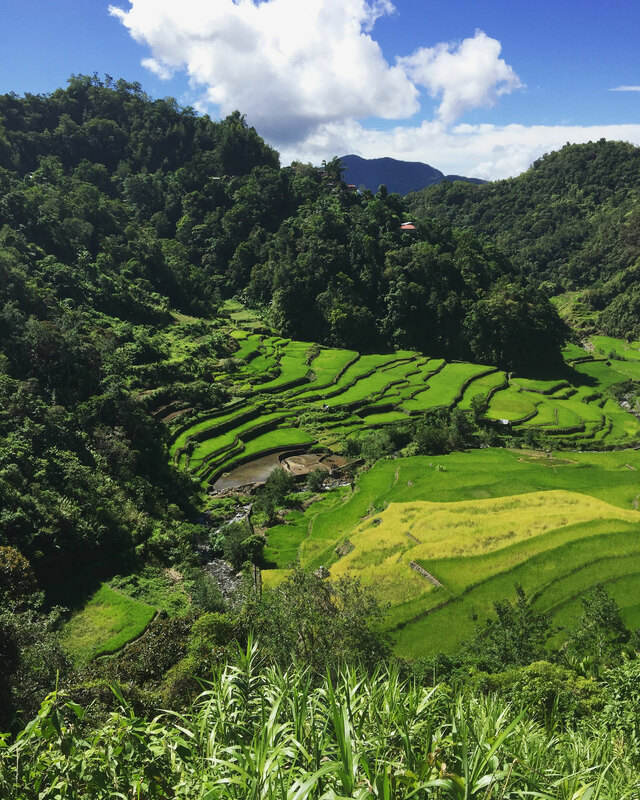 Banaue is a small town at the foot of some very nice rice terraces. The town has several hotels and guest houses (though its quite hard to find information about them online) as well as a handful of restaurants and cafes with internet access and great views of the nearby terraces. 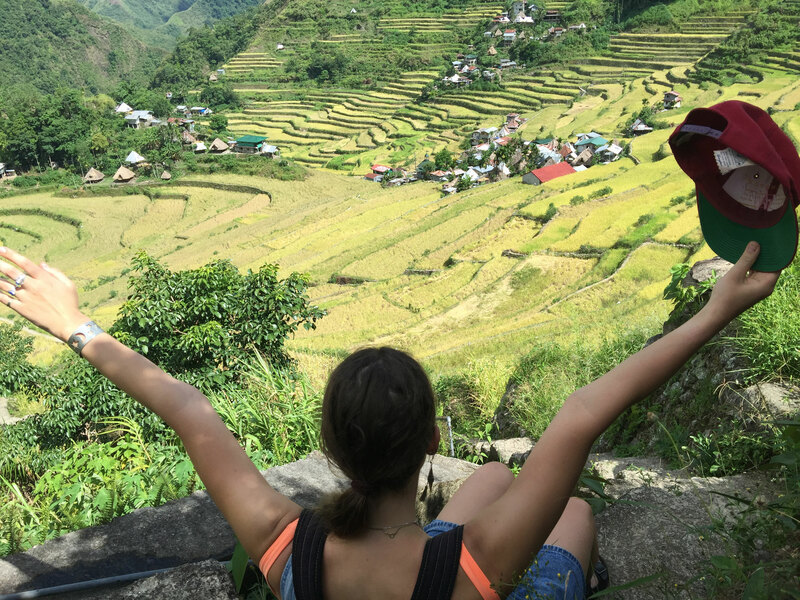 However, the prices do reflect the large number of tourists that stay there and Banaue is about an hours bus ride from the Batad Saddle Point where you begin the walk into Batad where the most spectacular rice terraces are. 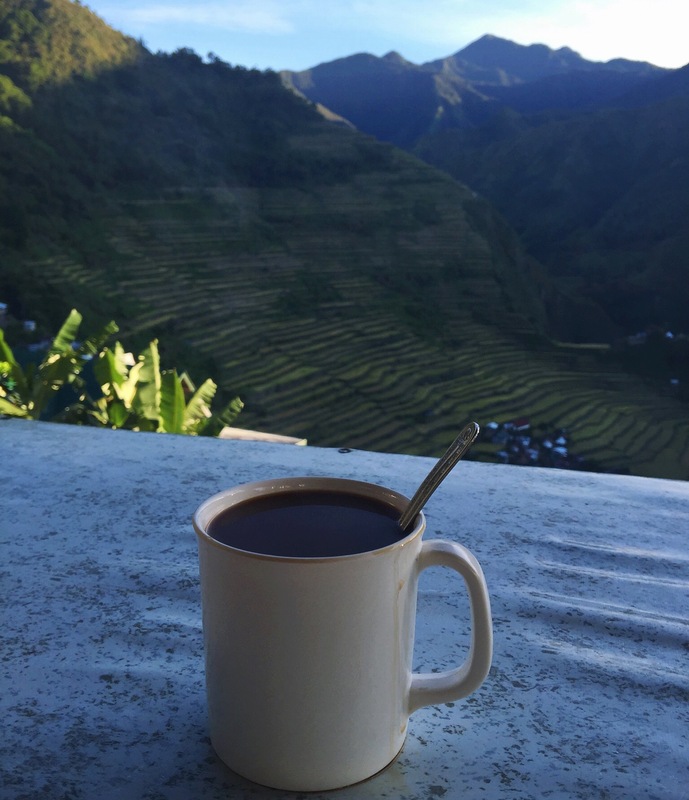 I would suggest skipping Banaue and going straight to Batad because that is what you came here for. The people who were on our bus also ran tour companies within the town and were very keen for us to book a guide for Batad through them. 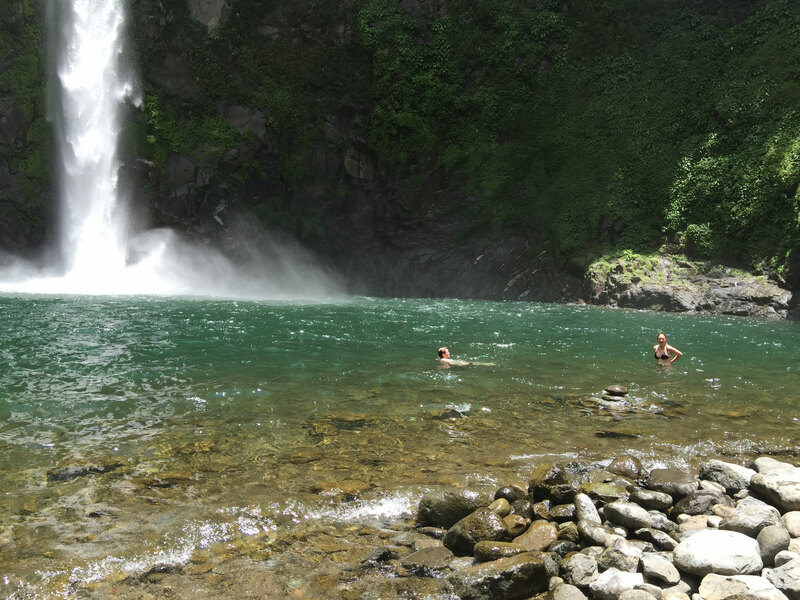 I'd read that most of the hikes, particularly the one to the waterfall in Batad, are do-able without a guide. We ended up booking a trike to take us to the mouth of the Batad hike that cost us 700 pesos. The trike ride was fun, being strapped to the side of a motorcycle in a little side carriage with amazing views of the mountains out both 'windows'. The ride takes about 35 minutes. 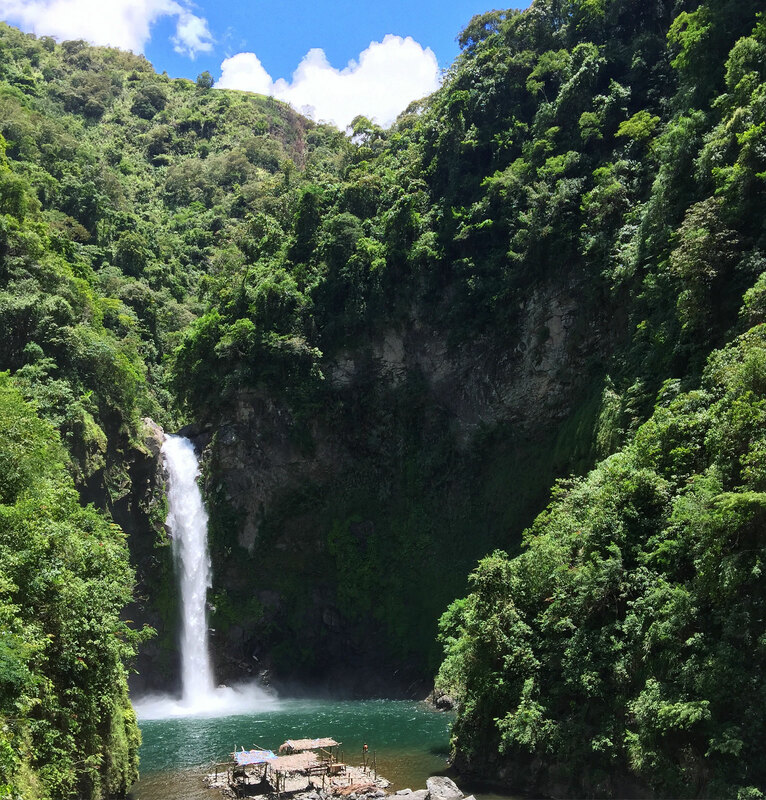 Once we arrived in Batad we hiked in through the jungle which took about 10-15 minutes and emerged to one of the most spectacular scenes I have ever seen. Listen to me when I say no photo will EVER capture the beauty and grand scale of this cauldron of rice paddies. The mountains in the distance frame the sky and the air is loud with chickens crows and cicadas. 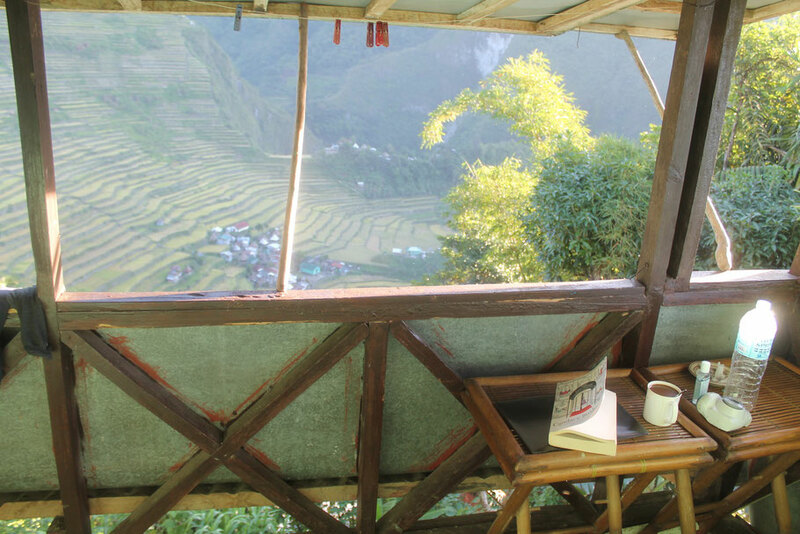 Waking up in Batad and eating breakfast with a view of the amphitheater of terraces is itself worth the trip. 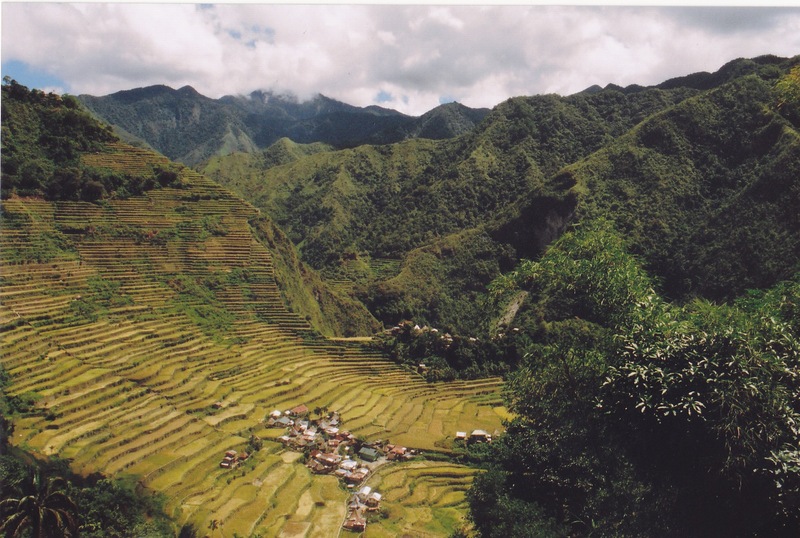 Even better, however, is geographic position of Batad among the terraces. 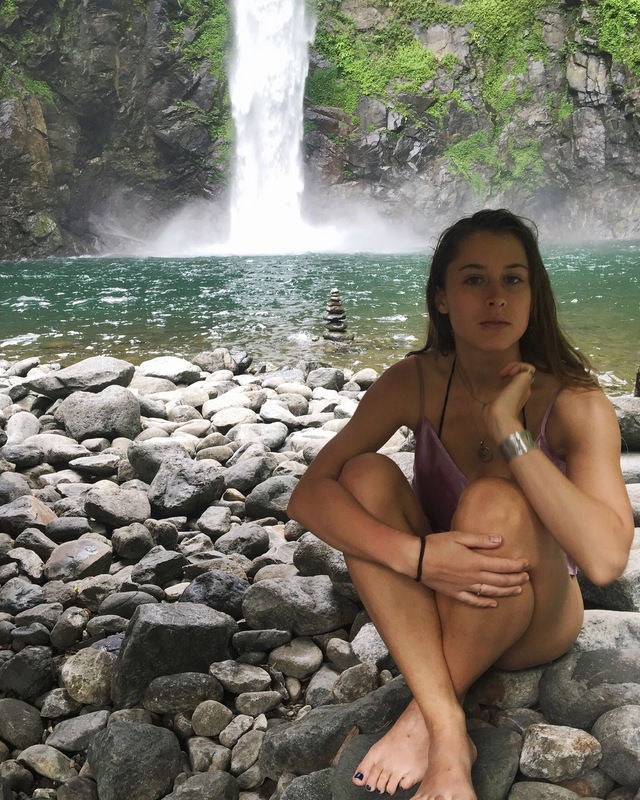 Here you are in position to jump off into several hikes ranging from one to several days that will take you through thousands-of-years-old terraces and villages that are only accessible by foot. 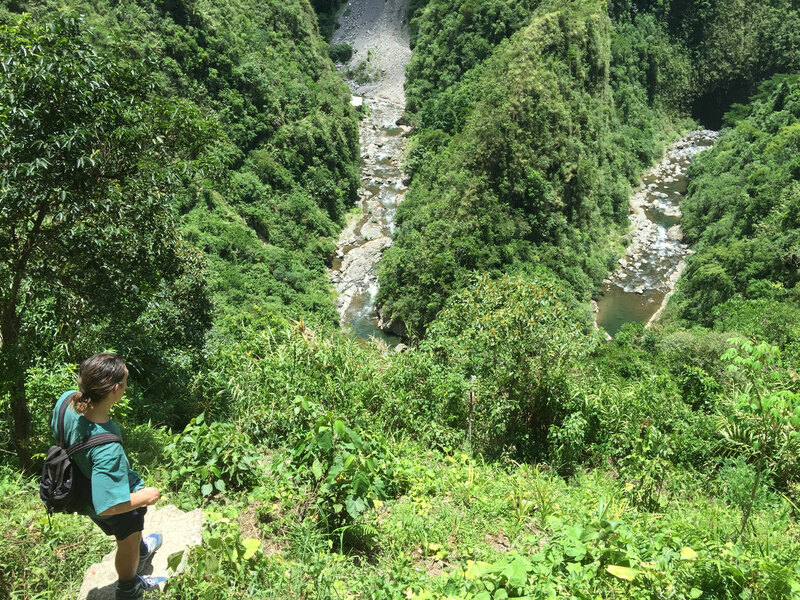 We had to pay another 50 pesos each to enter this section of the national park (which I think we could have avoided in Banaue because we weren't actually staying there). We didn’t have anywhere booked to stay here so we walked around and inspected several of the guesthouses. Our first option was Hillside which we had been recommended by several people however they didn't have a room with a window overlooking the terraces available (which was my only criteria) so we kept looking. 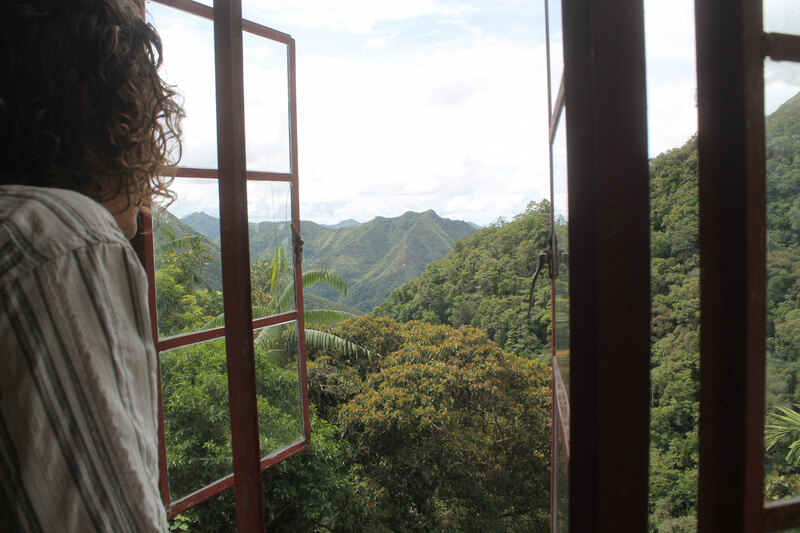 We ended up finding a room at Ritas Homestay which is one of the highest buildings in Batad. We had several windows giving us a panoramic view of the valley that surrounded us and a balcony that overlooked the rice paddies. It cost us 250 each a night which is around $7. We definitely could have found somewhere cheaper but the convenience and beauty of this place made it unnecessary. Like most guesthouses there was a restaurant downstairs with equally beautiful views and decent, cheapish food. After settling in and buying some water, we decided to start our hike to the waterfall. We didn’t want to have to pay for a guide so we asked the woman who ran the guesthouse how to get there and she happily explained. It’s a very simple route that travels through the rice paddies however be warned this was by far the most brutal hike I have ever done. It takes about an hour and a half to get there and an hour and a half back and the entire thing is stairs… STEEP stairs. 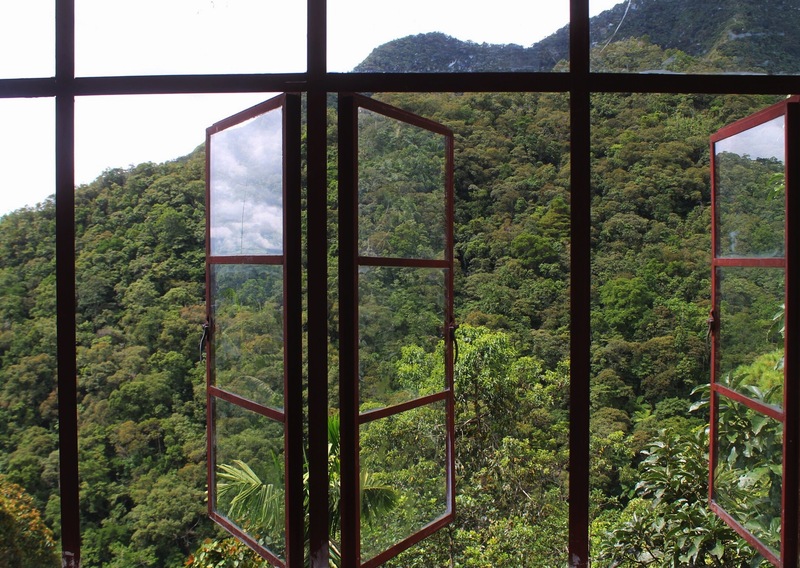 Luckily there are small huts selling cold drinks at every high point giving you a chance to rest and look at the view. 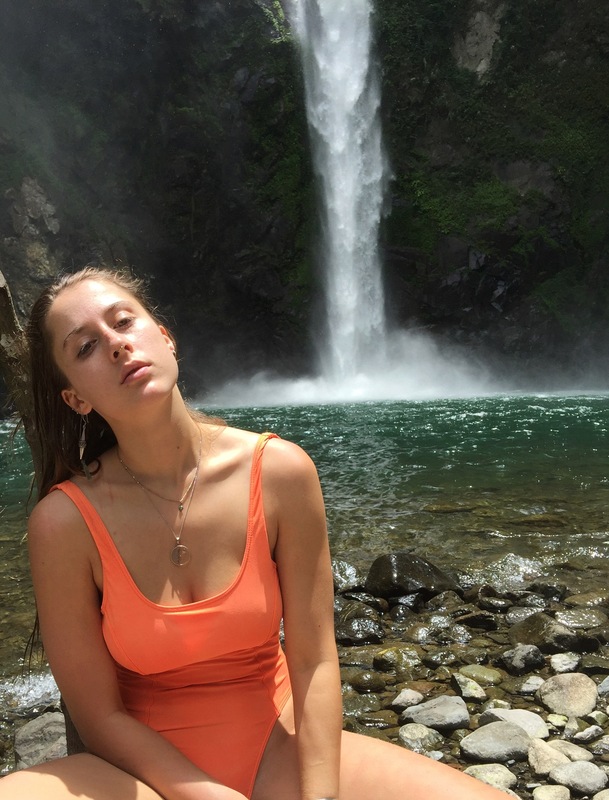 As for the waterfall… it was without a doubt the best waterfall I have ever seen. We had very low expectations, as I had seen photos of a muddy, dark alcove with the waterfall in the middle which was absolutely nothing like what it was actually like. 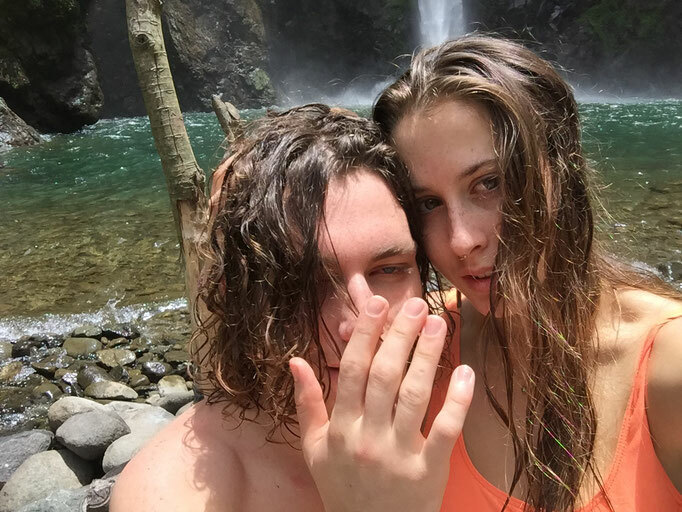 As we rounded the final corner of the hike and the waterfall came into view we both laughed. It was comical how beautiful this thing was. 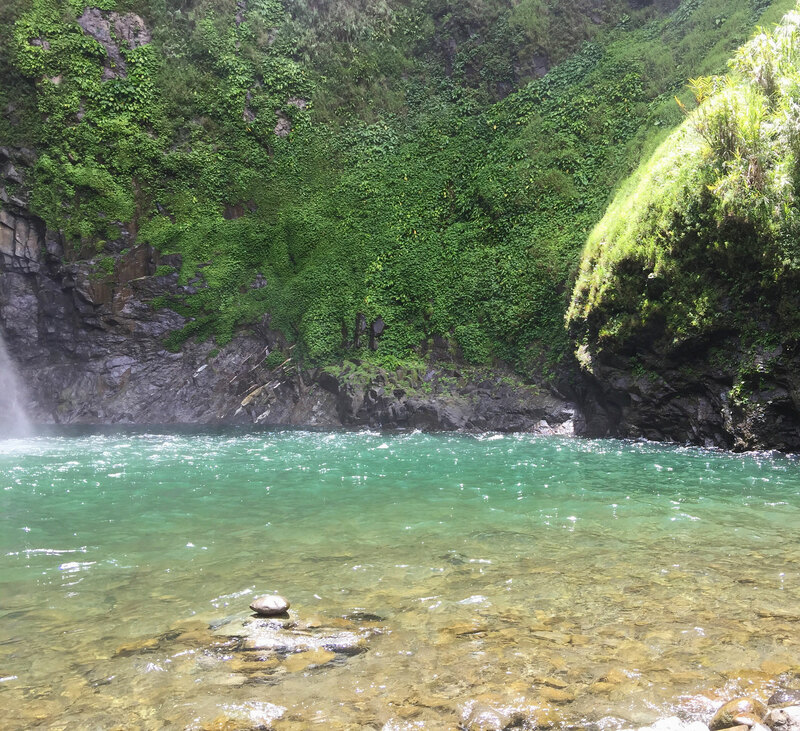 At the base of green mossy mountains that towered above it, the water fell (at least 50 meters high) with extreme force into an aqua green pool that was surrounded by green mossy cliff faces and wooden shacks to shelter you from the sun. Needless to say we were glad we came. 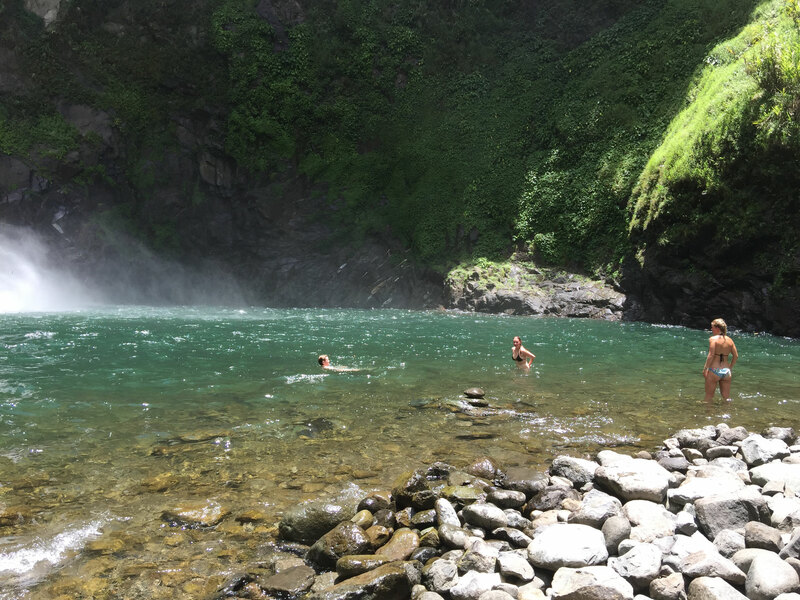 We spent about 2 hours here, jumping in and out of the water and lying in the sun. Make sure you bring plenty of water and sunscreen as you are exposed to the sun for most of the walk and Ebbs got incredibly burnt (10/10). The round trip took us about 5 hours so make sure you give yourself enough time. 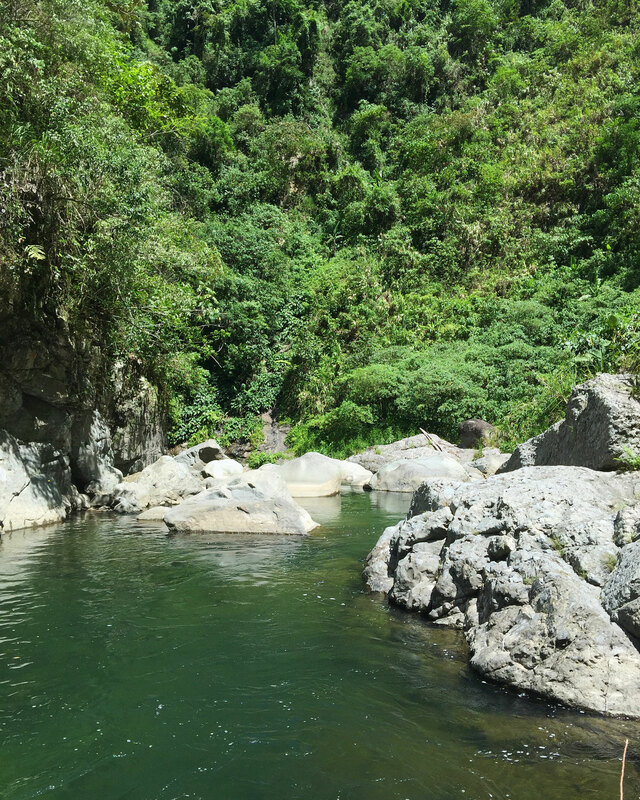 There was also an amazing swimming hole just off the track on the way back from the waterfall that we went skinny dipping in (hooray). The walk back was brutal and there are showers here but you have to pay so although we were sweaty we just washed our faces under the tap. There is also no toilet paper because people here use their hands (yay) so make sure you bring some tissues and hand sanitiser. We got back to our room at about 3 30pm. We hadn't had anything to eat since breakfast so we were starving and after an unplanned 2 hour nap (yep) we had an early dinner overlooking the rice paddies. The food was basic but it filled you up, don’t be expecting anything gourmet... the noodle soup was literally 2 minute noodles in the broth that you cook them in. After our early dinner we got into bed to protect ourselves from mosquitoes and ended up falling asleep at around 7pm but not before we saw fireflies buzzing around our window. FIREFLIES!!! 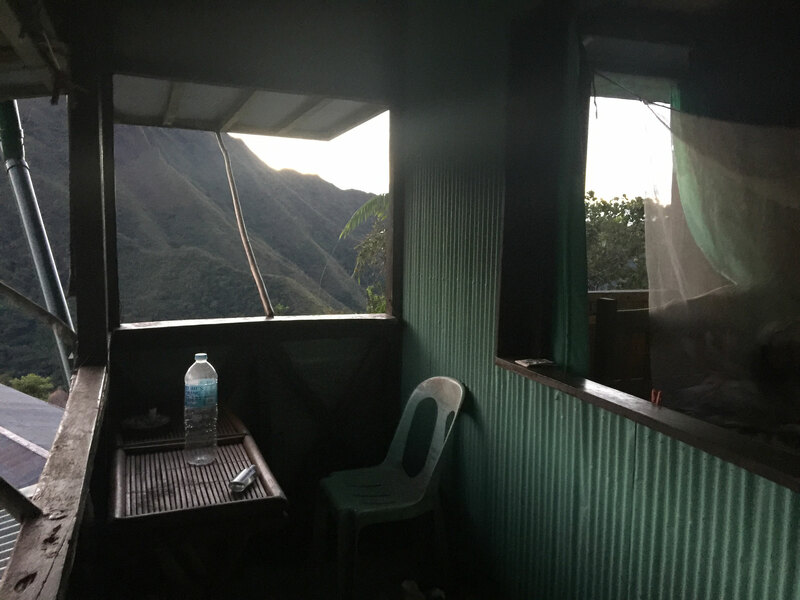 On our second day in Batad I put my alarm on for 5 am so I could watch sunrise from bed over the mountains however I was woken up well before then by the crowing of the roosters (which was soooo much louder than you would expect). The sun rose behind the valley, casting a smokey light over the rice paddies and the mountains below. Seeing as we had gone to bed at 7pm the night (maybe even earlier we were so tired) I got up with the sun and sat on the balcony to write and read my book. I ordered a coffee from the lady we were staying with and had a very nice time watching the world below me. Ebbs got up at around 8 and we both ordered a big breakfast (similar to what we ate the night before) and then packed up our room. Check out was at 9am but we were able to leave our luggage in the guest house so we could hike down to the waterfall again. We were hesitant to go again given how much we struggled the first day, but we knew the way this time and it wasn’t as sunny so the walk was actually far easier. 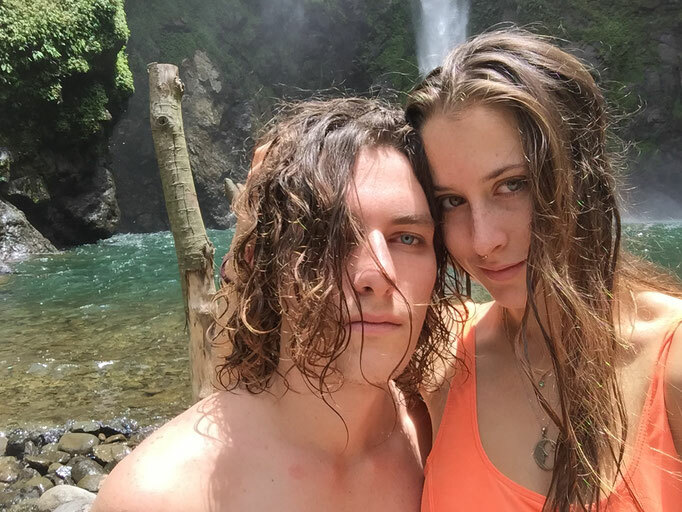 The waterfall wasn’t as beautiful because the sun wasn’t out so the water didn’t shine the same aqua blue as it had the day before. We stayed for a few hours and then walked back to our guest house where we cooled down with a cold drink and spent the next few hours watching the view and reading. The woman who ran our guest house organised for a trike to come pick us up at 3pm so we put all our stuff on our backs and hiked back to main road. We found our driver and all was going well until less than 2 minutes into the drive the wheel of the trike snapped off and obviously we couldn’t go any further. We had to hike with all our stuff up to the saddle (which is essentially a half hour walk directly up) it was boiling hot and with no prospect of rescue transport out of here because there was no phone signal we weren't in the greatest mood. Luckily once we got to the saddle point our driver could text someone to come pick us up and half an hour later we were on our way again. 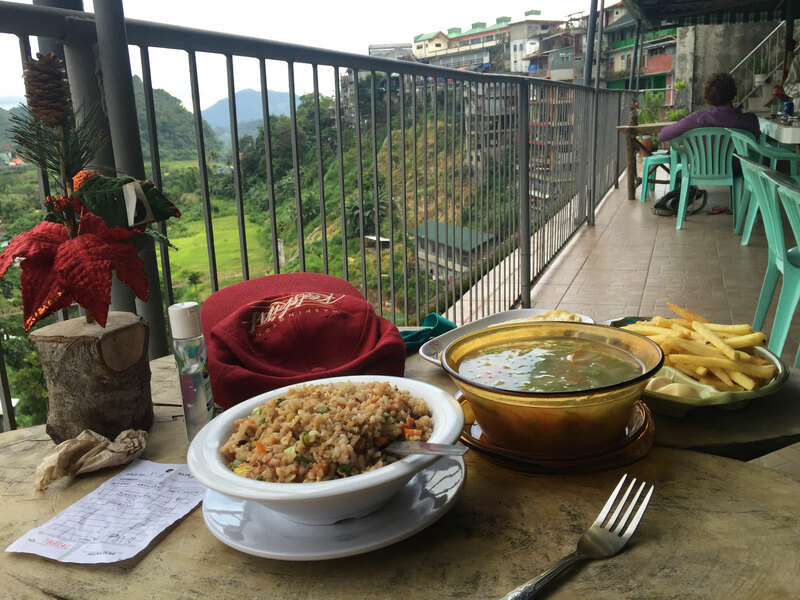 Once we arrived in Banaue we headed straight for the Halfway Café where we had had breakfast on the first day. 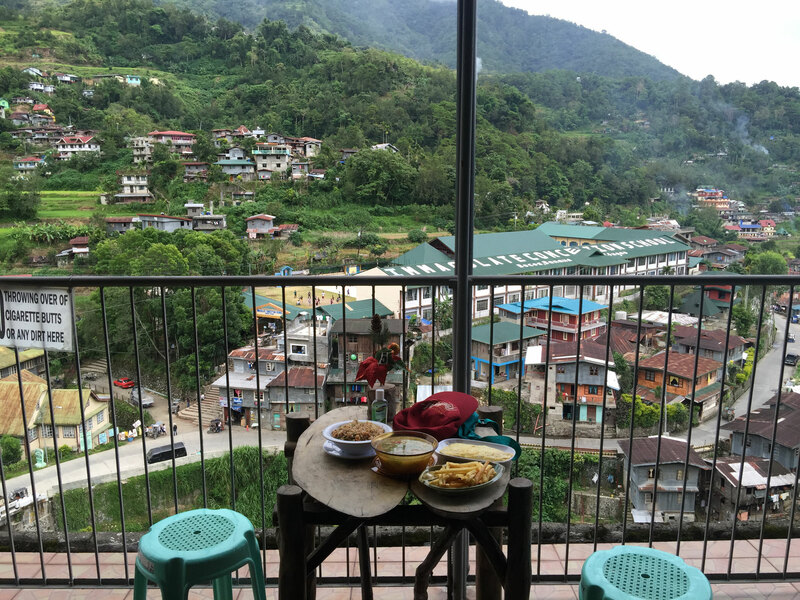 We quickly ordered food as it was 5pm and we hadn't eaten since breakfast at 8 and sat and watched the clouds creep over the mountains that surrounded us. The café had wifi and a charging point that cost 80 cents to use (20 pesos) it wasn’t the best wifi but it was better than nothing. I called dad and told lucy I was still alive. Half an hour later after we'd eaten all our food and changed into our bus clothes it started to absolutely pour with rain. As I predicted (Ebbs disagreed) it only lasted 20 minutes and then cleared so we were able to walk up to the bus stop for our bus departure at 7 without getting drenched. 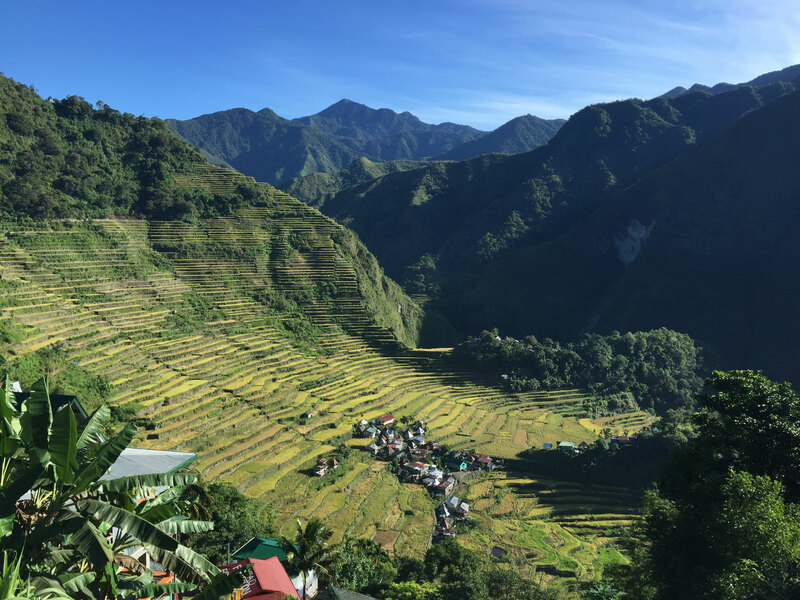 Don’t bother staying in Banaue unless you have lots of time, the true beauty in the region is in Batad. You don’t need a guide to get to any of the sight seeing, they will try and convince you that you do but the trails are easily marked and if you get lost you can always ask someone. 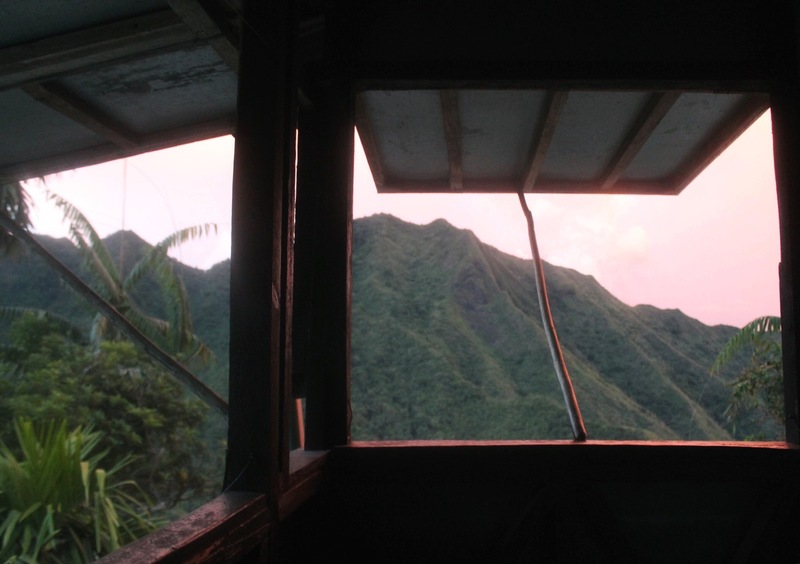 You have to pay an entrance fee of 50 pesos per person to stay/enter Batad. Make sure you take an ample amount of cash with you (3500 pesos would be plenty) as there are no ATMs and no-where will accept cash.